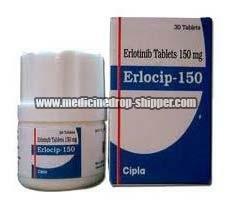 We are the leading Exporter and Supplier of superior quality Erlocip Tablet. Used for the treatment of non-small cell lung cancer & pancreatic cancer, the offered Erlocip tablet is processed by using the high-grade chemicals and sophisticated technology under the observation of vendors pharmaceutical experts. In order to meet the various requirements of customers, this Erlocip tablet is hygienically packaged in various packaging options.